According to the US Environmental Protection Agency, transportation accounts for about 14% of global emissions and in the United States, the largest source of CO2 emissions mostly comes from trucks and SUVs. Thanks to the electric vehicle manufacturers, the statistic is going to be changed soon since all-electric vehicles produce zero direct emissions which specifically helps improve air quality in urban areas and reduce ecological damage. 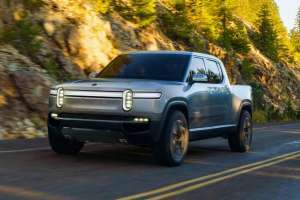 To help accelerate the process California-based automotive start-up called “Rivian” is launching its first all-electric pickup truck called the “R1T”. Rivian R1T is the first electric truck in the world and it is Rivian’s first electric vehicle. Unlike other electric vehicle startups, Rivian automotive has been prepared for this event for about ten years and already acquired a former Mitsubishi Factory in Normal, Illinois to secure mass production of its vehicles. The five-passenger vehicle with its impressive specifications is going to compete with gas-powered pickup trucks on the market. The company classifies it as an electric adventure vehicle that looks for a burst and rugged but at the same time is sophisticated and intelligent. Rivian electric drive delivers remarkable power and torque through four independent motors on each wheel giving the Rivian R1T all-wheel-drive capability. It comes with three different battery pack options which have the highest capacity of any other passenger electric vehicle. The company promises a fully upgradable platform with over-the-air software updates and says level 3 autonomy capable Hardware will come standard on every Rivian vehicle allowing them to have a self-driving capability. The biggest version will have a 180 kWh capacity that will enable the truck to achieve 400 miles of range on a single charge. Rivian will also offer 105 kWh and 135 kWh battery pack variants with 230 miles and 300 miles of range respectively. One of the impressive features is that the different choices of battery packs merged different power levels. The mid-range battery pack version comes with electric motors delivering 562-kilowatt peak power output and 826 pound-feet of torque. This motor allows the vehicle to reach 60 miles per hour in an incredible 3 seconds that qualifies the R1T the quickest pickup truck in the world. All three versions of the truck have a top speed of 125 mph. The R1T is a little bit longer and taller than the new Ford Ranger or Toyota Tacoma and comes with a towing capacity of 11,000 pounds which is more comparable to the capability of a Ford F-150. Although it has a much more expensive price tag than its gasoline-powered counterparts, the vehicle comes with high-tech utility features besides the incredible performance. The minimalist digital dashboards will not only monitor the performance, efficiency, and safety of the vehicle but will also learn drivers preferences and adapt to the driving habits. In addition one of the key features of the truck is the amount of lockable storage that reaches around 1,000 liters overall. It comes as the company describes a lockable gear tunnel that extends by the entire width of the vehicle and provides more than 350 liters storage area. The Rivian R1T will start at 69,000 dollars before incentives in the US and be delivered in late 2020. The R1T will not be the only vehicle in its class at that time as Elon Musk is looking forward to launching Tesla’s own pickup truck that is supposed to be in production in 2020. The CEO of Tesla said it will be a six-passenger vehicle with a super futuristic design that will have an estimated driving range of 400 to 500 miles or maybe more. The payload and towing capacity of Tesla truck will be much more than the Rivian R1T. Let’s see if it will be quicker than the Rivian R1T. Michigan based Bollinger motors that’s famous with its Bollinger B1 SUV has unveiled an all-electric pickup truck the Bollinger B2 that will go into production in 2020. It will have dual motors with the total output of 388 kilowatts and 120 kWh battery pack to achieve more than 200 miles of range on a single charge. The full specifications and price details will be available in late 2019. 2020 will be the year of electric pickup trucks so get ready to experience the thrill of navigating the world in an electric adventure vehicle and also don’t forget to see our article about the future of transport industry.